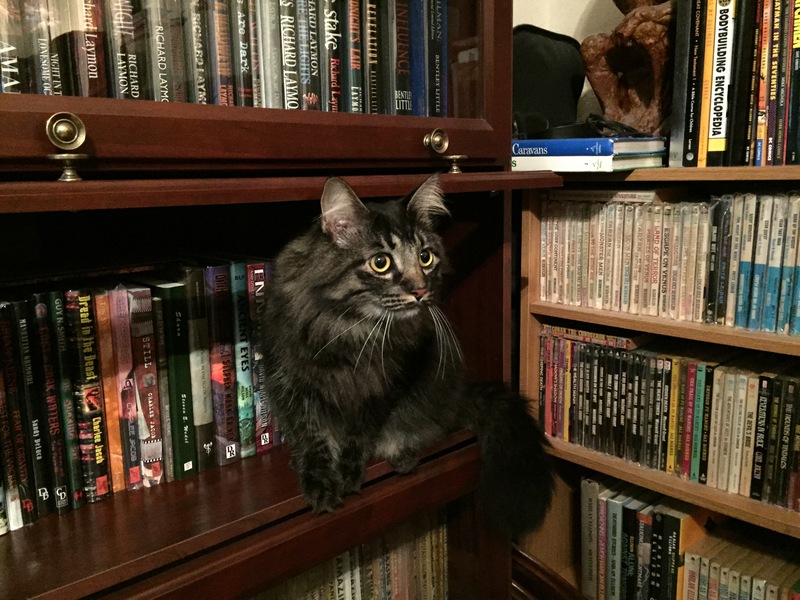 This is Shadow, the official mascot of Realms of Night. Here he is “helping” with the scanning. If I’m ever at a loss as to what should be scanned next, Shadow knows. Realms of Night is a side project of author Christopher Fulbright. That’s me. I not only write stories, but I collect stuff, too. Mostly books. Family visits to the house result in looks of disbelief when someone wanders into the master bedroom (a.k.a. the Vault of Horror) or upstairs where the floor-to-ceiling shelves make up the Wall of Mystery. This is no casual hobby — this is a lifelong commitment to scary stuff on the printed page. My actual friends are few and far between. Friends who’ve seen this collection can be counted on one hand, and even then, they’ve never taken time to look at everything. The hardcovers, the paperbacks, the magazines, the pulps. Never enough time. So, Realms of Night is intended as a cover art gallery. This will always be a work in progress. It has started as a gallery for the book collection — it might expand into something more. Movies? Maybe. Toys? Got ’em. Time will tell. No matter where the tentacles of this beast eventually end up, it should be fun. Pull up a chair. Take your time. Venture into the Realms of Night.